Form Description: Even for the most mathematically inclined people, keeping track of your personal finances can be a tad difficult and confusing. With this Personal Financial Information sheet you should no longer have any difficulties. 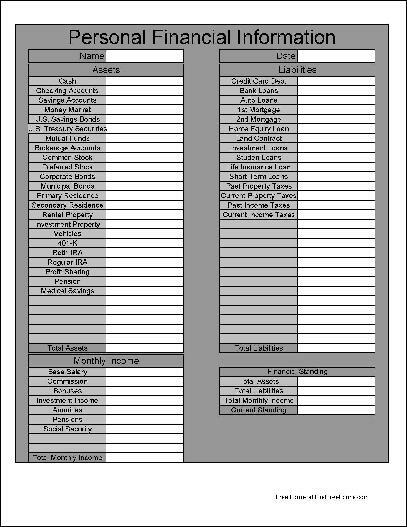 Simply fill out the requested information and you will easily be able to find what your current financial standing is. It really couldn't be any easier. This form ("Basic Personal Financial Information") is associated with the following keywords: Finance, personal, information, tracking, calculating, basic.